1859 - Our congregation first started gathering for worship. 1861 - Our original stone church was constructed on this site. 1909 - The original parsonage was razed and the new parsonage was built at a cost of $1,450. 1914 - The original stone church was razed and our present, red brick church, was constructed with the assistance of donated labor. 1930 - Our original pipe organ was purchased for $ 5,000.00. 1934-1957 - our congregation was known as the First Evangelical and Reformed Church. 1957 - The Evangelical and Reformed Church merged with the Congregational Christian Church. Since then, our denomination has been the United Church of Christ and our congregation is known as the First United Church of Christ. 1958 - The Harrisburg Church, which began in 1867, joined our congregation on May 18th, 1958. 1963 - The education building was added, which serves as a meeting place for our Sunday School, various church groups and several community organizations. It also contains the church offices and a fellowship hall. 1975 - A remodeling of the church took place. 1989 - The parsonage received an extensive remodeling. 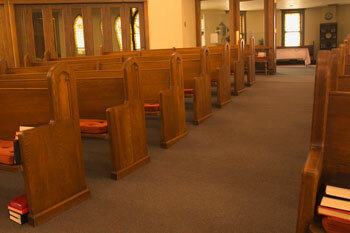 1996 - The church completed an 'access project', which consisted of adding an elevator and a connecting hallway between the church and education building basements. In 1820, three unrelated groups, Methodists from North Carolina and Virginia, Baptists from Vermont and Presbyterians from Kentucky, united under the name of "Christian" and later became known as "The Christian Church." Congregationalism was brought to America by the Pilgrims who landed at Plymouth Rock in 1620. As our country developed, congregationalism also grew and became known as "The Congregational Churches". "In 1931 a Union of what through the years had come to be known as the National Council of Congregational Churches was effected with the General Convention of the Christian Church under the name, Congregational Christian Churches." Early in 1700 a group of Reformed immigrants from Europe arrived at Philadelphia, Pa. near which the first Reformed congregation was organized in 1725. From this small beginning the Reformed Church in the United States developed. A century later some Germans migrated to this country and located at St. Louis, Mo. With the development of the mid-west, this group of Christians became known as The Evangelical Synod of North America. On June 26, 1934 at Cleveland, Ohio, The Reformed Church in the United States and The Evangelical Synod of North America merged, to constitute The Evangelical and Reformed Church. The merger of this denomination with the General Council of the Congregational Christian Churches to form The United Church of Christ took place in Cleveland, Ohio on the evening of June 25, 1957. We are proud of our past history, happy in the present and hopeful for the future. In the past 40 years we have had the faithful service of the following organists who have given of their talents and services for the glorification of God in our church. It is an honor to have had these people play for us: Mrs. Selma Clement served for 51 years, playing the old pump organ and the new pipe organ. Mrs. Charlotte Fradette Monette, Kalamazoo, Mich.